You’re familiar with drop-down menus in software applications and on websites. You can create a drop-down menu in PowerPoint, too. The main menu button is used as a trigger, so that when you click it, the animation starts. If you want the dropped-down menu to disappear for the next use, the method is a little more complex. Look at a drop-down menu in PowerPoint or other program. You’ll notice that the drop-down menu just appears under the menu name. If there’s some animation involved, it’s too fast to see. However, I liked the effect of a wipe down animation, so that’s what I used. You can use the Appear animation instead. 1. Insert an AutoShape/Shape. Add some appropriate text, such as Main Menu. 2. Then create your submenu items on AutoShapes/Shapes, just below the Main Menu button. Add text for the topics that you want to cover. 3. Select all of the submenu buttons and group them. In PowerPoint 2003, choose Draw on the Drawing toolbar>Group. (In 2007 and later, press Ctrl+G to group the selected buttons.) You do this so that all of the buttons drop down at the same time. 4. In 2003, choose Slide Show> Custom Animation. In 2007, choose Animations tab> Animations group> Custom Animation. In PowerPoint 2010 and later, click Animation Pane. 5. 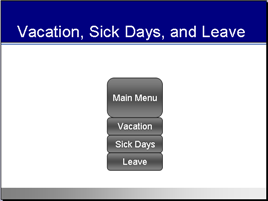 In PowerPoint 2003 & 2007, select the grouped submenu buttons, and choose Add Effect> Entrance> Wipe. In 2010 and later, choose Add Animation, Entrance, Wipe. Set the Direction to From Top. Set the Speed to Very Fast. 6. You want the menu to wipe down when you click the Main Menu. In the Animation task pane, click the submenu’s drop-down arrow and choose Timing. 7. Click Triggers, then choose Start Effect on Click Of. From the drop-down list, choose the Main Menu object. Click OK.
8. It’s nice if the submenu buttons disappear so that the next time you display the menu slide, you again have to click the Main Menu button to drop them down. Select the grouped submenu buttons, and choose Add Effect/Animation> Exit> Disappear. The new exit animation (shown with a red star) should appear above the trigger; if not, drag it up. If you now create links on the other slides to go back to this slide, you’ll find that the submenu doesn’t disappear. It may disappear once, but try again, and the Disappear animation won’t work any more! that’s because PowerPoint disables certain features when a slide is displayed more than once. The next two steps fix this problem. 9. To make sure that the submenu disappears each time, click the Main Menu Slide in the left Slides pane and press Ctrl+D to duplicate that slide. Then select the first of the two identical slides. On that first slide, delete the submenu so that only the Main Menu button remains. 10. With that first slide still selected, choose Slide Show> Slide Transition in 2003 . (In 2007 and later, choose the Animations tab.) Uncheck the On Mouse Click check box and check the Automatically After check box, which should say 00:00. 11. Select the topmost of the submenu AutoShapes. Because the submenus are grouped, this selects all of them. Now click the edge of the top submenu shape. Choose Insert> Hyperlink. In the Hyperlink dialog box, choose Place in this Document, and choose the slide that the topmost submenu should link to. Do the same for the other submenu AutoShapes. 13. Copy your hyperlinked button onto the other slides that you’re linking to. These buttons get you back to the Main Menu. Am hoping to start designing elearning applications using powerpoint including quizzes etc. do you have any specialized training on this? My ebppl. 101 Advanced Techniques Every PowerPoint User Should Know has a technique (#7) on creating a quiz without VBA (which involves programming). You can read more about that ebook at http://www.ellenfinkelstein.com/estore/101advancedtechniques.html. Finally, my book, PowerPoint for Teachers, has a technique (which involves VBA) for creating graded quizzed. Here’s the link to that book on Amazon.com: http://www.amazon.com/gp/product/078799717X?ie=UTF8&tag=ellenfinkelstein&linkCode=as2&camp=1789&creative=9325&creativeASIN=078799717X. I purchased this add on, it is not a drop down? It’s simply a navigation button add on… I’d like a refund? There’s nothing for sale on this page. I don’t understand what you could have bought. Wow, thanks!! This worked so well and was just what I needed. I’ll come to your blog FIRST for sure next time I need any PowerPoint help! Thankyou very much for very very useful tips that help me in my tasks. Hope you continue on the way to post and help. Only second in Google results, but tops in my opinion. Please help me repair my powerpoint 2007. whenever i tried to make an animation and press the add effect, i cannot see the dropdown menu of “entrance, exit, etc”. What i saw was shadow of the dropdown menu i supposed. what shall i do. Thanks. Hernie, without looking at your computer, it’s hard to know. Do you have an object selected? If not, the options are “grayed out,” that is, unavailable. If you can find someone else with PowerPoint and try on their machine, you might see if the problem is unique to you are not. Thanks for the usefull tips. Good tutorial. The problem with this is when you have a lot for the drop down menu, there isn’t a scroll bar. It is good for short drop downs but not for those with many. Also I cannto get the dropdown menu to go back up again once I’ve hyperlinked one of the options. When I go back into that slide it is already down instead of me clocking again for a drop down menu.